The lithospheric structure of the western part of the Mediterranean Sea is shown by means of S-velocity maps, for depths ranging from 0 to 35 km, determined from Rayleigh-wave analysis. The traces of 55 earthquakes, which occurred from 2001 to 2003 in and around the study area have been used to obtain Rayleigh-wave dispersion. These earthquakes were registered by 10 broadband stations located on Iberia and the Balearic Islands. The dispersion curves were obtained for periods between 1 and 45 s, by digital filtering with a combination of MFT and TVF filtering techniques. After that, all seismic events were grouped in source zones to obtain a dispersion curve for each source-station path. These dispersion curves were regionalized and after inverted according to the generalized inversion theory, to obtain shear-wave velocity models for rectangular blocks with a size of 1° × 1°. The shear velocity structure obtained through this procedure is shown in the S-velocity maps plotted for several depths. These maps show the existence of lateral and vertical heterogeneity. In these maps is possible to distinguish several types of crust with an average S-wave velocity ranging from 2.6 to 3.9 km/s. The South Balearic Basin (SBB) is more characteristic of oceanic crust than the rest of the western Mediterranean region, as it is demonstrated by the crustal thickness. We also find a similar S-wave velocity (ranging from 2.6 km/s at the surface to 3.2 km/s at 10 km depth) for the Iberian Peninsula coast to Ibiza Island, the North Balearic Basin (NBB) and Mallorca Island. In the lower crust, the shear velocity reaches a value of 3.9 km/s. The base of the Moho is estimated from 15 to 20 km under Iberian Peninsula coast to Ibiza Island, continues towards NBB and increases to 20–25 km beneath Mallorca Island. While, the SBB is characterized by a thinner crust that ranges from 10 to 15 km, and a faster velocity. A gradual increase in velocity from the north to the south (especially in the upper 25 km) is obtained for the western part of the Mediterranean Sea. The base of the crust has a shear-wave velocity value around of 3.9 km/s for the western Mediterranean Sea area. This area is characterized by a thin crust in comparison with the crustal thickness of the eastern Mediterranean Sea area. This thin crust is related with the distensive tectonics that exists in this area. The low S-wave velocities obtained in the upper mantle might be an indication of a serpentinized mantle. The obtained results agree well with the geology and other geophysical results previously obtained. The shear velocity generally increases with depth for all paths analyzed in the study area. 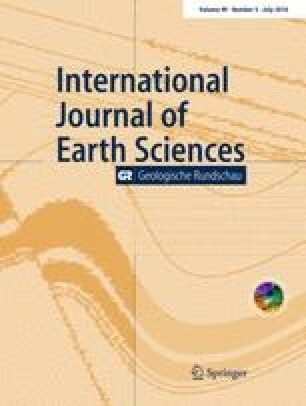 The authors are grateful to Instituto Geográfico Nacional (Madrid, Spain), who provided the seismic data used in this study.